It has been more than three millennia since the ancient galactic empire crumbled and the Twilight Wars erupted. After a period of devastating conflict, the great races retreated into remote and safe areas of space. Now, at the brink of a new era, the great races are moving towards the heart of the galaxy once more. The ancient Galactic Council on the central planet Mecatol Rex is regaining its influence, but the balance of power is becoming increasingly fragile. In the vast expanses of space, mighty fleets hover in tense anticipation, while trade wars rage across the stars. Ancient technologies are being rediscovered, and forgotten feuds remembered. Galactic tension is reaching unsustainable levels, and another war seems inevitable. As the great races prepare themselves of the struggle to come, they know one thing is certain: only one race will become the progenitor of a new galactic expire. The Twilight Imperium boardgame allows players to take control of a powerful galactic civilization and guide their race to supremacy. Only by employing clever political negotiation, opening interstellar trade agreements,and waging merciless war will a player find the path to the imperial throne and victory. With is unique tile-based game board, vast number of exciting player options, and hundreds of cards, Twilight Imperium provides a unique game experience every time it is played. Detailed plastic pieces high-quality components, and clever game design make Twilight Imperium the definitive space-conquest, empire-building boardgame. New detailed plastic pieces, including the new Destroyer and War Sun units. The Command System. An entirely redesigned core game mechanic that facilitates dynamic game play and faster playing times. 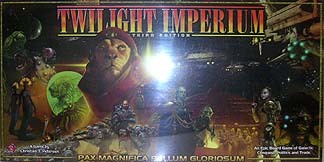 All 10 original Twilight Imperium races, including the Druua and the Llzlx. Enlarged game-board pieces and cardboard components of the highest quality material. New mechanics for interstellar trade. The "Strategy Card" turn-action system, which dramatically improves, balances, and simplifies the initiative and turn phases of the game round. Technology card decks with redesigned and updated technology advances. New victory objectives using public and secret Objective Cards. More than a hundred Action Cards, including dozens of new card abilites. A redesigned and almost entirely new 60-card Political Card deck. New, useful Planet Cards replace credits. New, updated unit abilities and costs. Rules and components for incorporating Leaders. Additional optional rules, including new "Distant Suns" counters and abilities. Redesigned and updated racial abilities. Six frames of highly detailed plastic components in six colours. Each frame contains the following: 5 Dreadnoughts, 4 Carriers, 8 Cruisers, 8 Destroyers, 2 War Suns, 12 Ground Forces, 10 Fighters, 6 Planetary Defence Systems (PDS), 3 Space Docks. Epic sci-fi themed '4X' game. Reserve a whole day to play. I played this last year for the first time and wow, it was a baptism of fire! Firstly, reserve a full day for a rules overview and to play the game, our game took 9 hours easy and we didn't even get finished properly! The game sees players competing for points which they gain by completing certain objectives and meeting certain conditions. I like the asymmetrical player powers that come with each faction, and I really enjoyed exploring the 'tech tree' which means you get more cool stuff and abilities to help advance your empire in the game. I also really enjoyed the diplomacy aspects of the game, like passing laws and striking up trade agreements etc. What I didn't like though was the frustrating way the designer had throttled back the game in certain ways which made the game drag out! For example, only being able to declare one objective per round, even if you have fulfilled another, or several. This means the game lasts longer. Also I found movement in the game frustrating, like not being allowed to move back into a sector once you have moved out of it? Again, it made movement slower and progress slower... also combat was a TON of dice rolling, which I found a bit anti-climactic and unsatisfying. Other than that the game is sound and gives a good event-style experience. Components and artwork are solid as well. Not one that I will be going back to anytime soon though, as there are a ton of other games I could play in the same amount of time! This is the ultimate space empire building game. It is a huge sprawling game which because of its size take a long time to play, you should expect to a full six player game to take an afternoon and evening to play out, so be warned, its not that the game is over the top complex, its just that with multiple planets to activate and combats to run turns can take a while to play out. However the game you are playing is about as complete as you would want, there is space combat, technology development, Alien races with unique abilities, trading, politics and death star sized starships (there are even rules for sabotage runs against the death star). The game uses dice resoluton for combat, but is very euro style for its resource management and on the whole, for a game of its size it flows well although it has a steep learning curve at the start. The game plays 3-6 but is better with more rather than less players. Value for money is hard to gauge, the quality of the game is very high as usual for FFG, however I cant imagine many people being able to get the time to play this on a regular basis, but at least when you do you will have a memorable gaming experience. There are numerous options in the box for tweaking the game and the expansion further expands the game. One thing to note is that many experienced players of the game suggest that the Imperial strategy card in the game is over powered and should be toned down, I would agree with this, the original card makes it too easy for the first player to win the game. FFG have acknowledged this and have a replacement card to download free from their website, and new strategy cards are included in the expansion. You could just house rule that the original card give only 1 VP rather than 2 Vps and you would be close. A minor flaw in an otherwise great product. This isn't a game that you will play in an hour or two. It took us over an hour for the first turn alone while the rules were explained, but then the following rounds only took 30 minutes or so each. Even with that, a two player game took us around six hours, but we did thoroughly enjoy the game, (even though the game is for 3-6 and we adapted the three player game for two, which worked quite well). Was it �60 well spent? I think it was and if you like this sort of resource management game with lots of decisions to be made and strategies to follow, then I think that you will enjoy it also. This is the third edition of the game and from what I hear, it is the definitive version of the game, not having personally played the previous versions before. How much stuff do you get, took a mate of mine ages to get ready for a 4 player game. The game play itself seems good as well (only played two rounds so far). I am really looking forward to get into the space combat. The balance of actions and what you need to do to what you want to do also seems about right although my opinion of that might change once I have played it a bit more. Will know better once I have played it more.